To most people getting on with their lives and listening to the mass media debates about climate change, ocean plastics and deforestation, “this sustainability thing” can seem overwhelming, frustrating and hopeless. But concern about climate change and environmental damage has been growing for decades (if not centuries – the problem of climate change was identified back in the 19th century). Whole new paradigms for doing business and delivering value like Natural Capitalism, The Natural Step and The Blue Economy. New models for doing better business, better agriculture and better aquaculture such as Permaculture, 3D Ocean Farming, Circular Economy and Systemic Design. New design approaches for developing cleaner, smarter technologies, products and services – such as Biomimicry, Cradle to Cradle Design and the Service Economy. A while ago I started a time line on the wealth of solutions going around – but these in particular are the ones I keep coming back to as core concepts. They’re loosely organised by time, and by no means an exhaustive list of entrepreneurial action. What it reflects is some of the key design and paradigm shifts that make sense in the context of my supply chain years. Permaculture is a word coined by Bill Mollison to reflect the need for permanent systems of both agriculture and culture, as he and his team expanded earlier work on permanent agriculture. It challenges us to consciously design and maintain agriculturally productive ecosystems with the diversity, stability, and resilience of natural ecosystems, creating sustainable human systems as well as productive agriculture. Karl-Henrik Robert founded The Natural Step in Sweden, setting out the system conditions for the sustainability of human activities on earth, based on systems conditions derived from the Laws of Thermodynamics. Gunter Pauli establishes the Zero Emissions Research Initiative (ZERI) Foundation to explore strategic levers to develop true sustainability. ZERI research led to the report “The Blue Economy”, published as a report to The Club of Rome in 2010. The Blue Economy sets out to challenge first-generation “green” approaches to sustainability, that were perfective and efficiency-oriented but did not fundamentally challenge mine/make/use/dump approaches and top-down, global supply chain models. Blue? Because the sky is blue, the sea is blue, the Earth from space is blue – let’s keep it that way. More than just technology innovation, The Blue Economy is based on localised solutions that use local resources to meet local needs, applying global design and biomimicry-based technology solutions to regenerate ecosystems and renew communities. Janine Beynus publishes “Biomimicry: Innovation Inspired by Nature“, describing how Nature’s 3.8 billion years of design brilliance can be applied to sustainability innovation. The Biomimcry Guild was formed in 1998, developing into the Biomimicry Institute in 2006. Industrial thinking primarily uses energy-intensive mechanical and chemical engineering to make products. Biomimcry investigates how natural systems use physics, biology and biochemistry to deliver low-energy, safe, recyclable products and materials (e.g. fibres stronger than Kevlar at room temperature – spider silk; water purification without poisons or mechanical filters – whirlpools and tornadoes). 4) Invest in natural capital – the ecosystem that supplies our food, water and air. Michael Braungart and William McDonough published “Cradle to Cradle: Remaking the Way We Make Things”. They proposed an economic, industrial and social framework that creates systems that are not only efficient but also essentially waste free, producing products that are totally safe to make, to use and to dispose of. From the initial concept and book, the movement has progressed to full certification with the Cradle to Cradle Products Innovation Institute. Ellen Macarthur established a foundation to promote The Circular Economy as a genuine economic paradigm shift. the Foundation brought together partners including B&Q, BT/Cisco, National Grid & Renault. Building on the work of earlier and parallel innovators, the Foundation’s brief is to accelerate the takeup of new design principles for an economy where materials flow around an endless loop, replacing the Industrial Economy’s one-way mine/make/use/dump paradigm. In 2013, veteran sustainability entrepreneur Paul Hawken established Project Drawdown – the first attempt to create a “shopping list” of the best solutions for reversing climate change. Calling on Stephen Covey’s fundamental principle “begin with the end in mind”, he brought together 70 advanced researchers from 22 countries to quantify what it would take to get to the point of “draw down” – taking more GHG out of the atmosphere than we are emitting. The results surprised a lot of people – including the researchers. The 80 most powerful solutions for reversing climate change aren’t just about preventing or replacing well-known, high volume causes. Along side “Onshore Wind Turbines” at #2 in the top 10 (of 80 actions) were unexpected solutions like “Better Refrigerant Management” at #1, “Reduced Food Waste” at #3 and “Educating Girls” at #6. Self-preserving human social systems that actively resist change and innovation, already under enormous stress from an unprecedented level of technology innovation. However, don’t let mass media messages fool you – we have the technology, we have the designs AND action is happening wherever there’s an entrepreneur with an eye to future opportunity. The question isn’t “can we fix it?” any more. 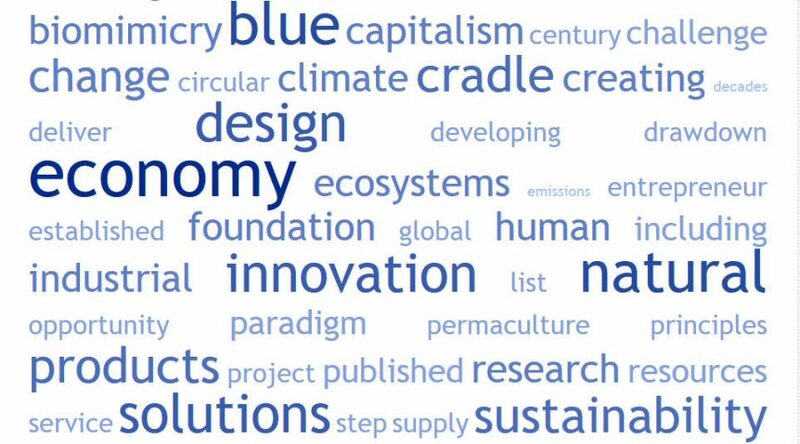 Will you use Project Drawdown’s top 80 solutions as a focus for opportunity spotting, or The Blue Economy’s systems mapping approach or dive in to Biomimcry resources at AskNature? What “should” you do about global warming?